The General overseer of a Pentecostal church in Akwa Ibom state identified as Pastor John and his wife, Deborah pictured above have been arrested by the Akwa Ibom state police command for allegedly kidnapping a new born baby with the intent of selling him to a child trafficking syndicate at Nung Ukot Itam, Itu LGA of the state for N300,000. According to Sunnews, the couple would adopt little babies in the guise that they want to raise them and then they would sell the children to their child trafficking syndicate. Confessing to the crime, Pastor John said “We have the mission to train children nd suddenly we changed our mind, when my wife and I ventured into selling of a new baby for N200,000.00 or N300,000.00 since we have a syndicate who could sell it for us’’he said. The police say he will soon be charged to court. 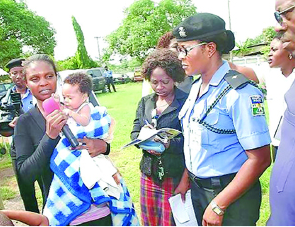 In a related development, the state police have arrested one lady simply identified as Sabbath for selling her 5 day old baby for N90, 000. Sabbath gave birth to a set of twins and decided to sell one of them, blaming it on poverty. When interrogated, she said ‘It was poverty that led me into this mess. It is true that I sold one of my twins for N90,000.00 to Mr Akpanam and Mr Samuel to be able to train the other baby. My husband’s family should forgive me for what I have done, it was poverty that led me into this’ she said.